The recent catastrophic oil spill on the BP/Transocean drilling rig Deepwater Horizon has inflicted colossal and undeserved harms on life in the Gulf of Mexico; thousands, if not millions, of individuals, businesses, and animals face ruination. In my mind, there is no question that BP is responsible not only for its neglect of safeguards that could have prevented the spill, but also for the incompetent, secretive, coercive, and litigious manner in which it has handled the spill’s aftermath. There is also no question that stopping the spill and mitigating the damage, where possible, should be the foremost priority in this situation. Yet the lessons and implications of this event remain disputed. Some have alleged, for instance, that the oil spill demonstrates a failure of free markets and the need to further restrict oil exploration and production by means of government force. However, the BP oil spill is a prime example of the failures of corporatism―a regime that is the antithesis of genuine free markets. Under corporatism, certain well-connected corporations receive special privileges from the federal government at the expense of individuals and less politically favored businesses. Moreover, the oil spill should become a classic study in unintended consequences resulting from restrictions on man’s ability to obtain and use natural resources for human benefit. Unfortunately, common misunderstandings of the fundamental factors that contributed to the oil spill are likely to lead to regrettable reactions that will further cripple the U.S. economy, damage consumers, and, in the long term, do more harm than even the spill itself. A corporatist regime, predominant in the United States today, does not derive its strength from businesses offering high-quality, reasonably priced goods which are intended to elicit the voluntary and sincere interest of consumers. In essence, the beneficiaries of corporatism attempt to insulate themselves from the dynamic of the marketplace, where, in the famous words of Milton Friedman, the only true sovereignty is consumer sovereignty. Special subsidies, entry barriers, exemptions from liability, legal prohibitions on competition, and bailouts for colossal failures are the chosen weapons of corporations seeking protection from having to accede to consumers’ wishes. Under corporatism, to paraphrase Ayn Rand, favored businesses thrive not on the basis of merit, but on the basis of pull. All too often, politicians either bow to pressure from corporate lobbyists overtly, or―even more frequently―enact laws that guarantee the continued dominance of established corporations while being presented as “public interest” legislation. BP is, and has been, one of the most corporatist entities on the planet. It has, for instance, hopped onto the “green” bandwagon and supported restrictive cap-and-trade legislation and taxpayer subsidies for producers of “alternative” energy. It did so in the hopes of itself benefiting from the holding and sale of carbon credits and government grants for the construction of wind and solar utilities that would otherwise not have been profitable. In 2000, it even changed its logo to the most blatant conceivable example of environmentalist pandering―a “helios” symbol combining the color green with definite allusions to both a sun and a sunflower. Some environmentalists have argued that this was mere posturing, not a genuine “pro-environment” stance on BP’s part, but that is beside the point. Many a politician, activist, and layman were persuaded by such propaganda to give BP just the special favors and status it sought. Instead of just honestly extracting, refining, and selling oil―or any other energy source―that consumers were willing to buy, at terms that those consumers would willingly accept, BP has been at the forefront of restricting competition through legal means. In a free market, BP would probably not have been in a position to make the mistake that led to the Deepwater Horizon spill; it would have been outcompeted by more efficient, consumer-friendly, and safety-conscious rivals long ago. Corporatism also poses a more direct obstacle to providing adequate compensation to many of the oil spill’s victims. The Oil Pollution Act of 1990 places a statutory limit of $75 million for an oil company’s liability for non-cleanup costs arising out of an oil spill, except in situations where gross negligence is proved in a court of law (which is extremely difficult to do). The cap, ostensibly intended to encourage oil exploration, is actually a boon only to the largest of well-connected corporations, who are the only entities with even a non-negligible possibility of inflicting damages on private parties in excess of $75 million. The common-law understanding of liability―essentially, if you are negligent, you must pay for the damage arising out of the negligent act―is annulled by this cap. Such an abrogation of justice has the potential to leave thousands of individuals, whose livelihoods were destroyed through no fault of their own, without recourse or compensation. While there is now an effort in the Senate to increase the cap to $10 billion, and this is an improvement, the actual damages from this spill may be far greater. Moreover, while BP has announced that it will pay for damages in excess of the statutory cap, the law still gives it the option to rescind that promise with impunity. But the biggest long-term consequence of corporatism is its chilling effect on economic, technological, and societal progress. Because of special political favors, some corporations become much more entrenched in the economic life of a society than any company could ever be in a free market. This motivates such companies to rest on their laurels and harvest oligopoly-level profits from consumers year after year, instead of being compelled by market pressures to continually innovate in order to maintain even razor-thin profit margins. Indeed, because of the inertia resulting from the colossal political barriers to entry into the oil business, some aspects of the technology used in that business have not been improved for over thirty years. This report from MSNBC’s Rachel Maddow presents numerous comparisons between the technologies used (also unsuccessfully) to contain the 1979 Ixtoc I oil spill and the ones BP has tried, with similar dismal results, in 2010. In a free market, any entity that fails to make virtually any technological progress in thirty years would be a distant memory. In a corporatist regime, it has the potential to devastate an entire region. At the same time, inefficient corporate bureaucracies hinder effective prevention and mitigation of disasters, while the extreme size of favored corporations―highly unlikely in a truly free market―contributes to a power asymmetry between the companies and the people affected by their mistakes. But, even though BP deserves the blame for the oil spill and its consequences, it is instructive to venture beyond the level of proximate cause and consider how the configuration of events that made such a spill even conceivable arose. Indeed, my first reaction upon learning about the oil spill’s massive spread and the scale of damage it caused was to wonder how it was even possible for a human error at one location to directly harm so many people in such a vast area. It would indeed require quite a bizarre chain of events to produce a scenario where one technical and policy failure by a private business could cripple a regional economy. But such a chain did occur in the United States over the past fifty years, and the radical environmentalist movement and bad laws are at least partly responsible. Radical environmentalists have long been ostensibly concerned about the dangers of pollution and effects on wildlife due to oil exploration and extraction―though, for many such environmentalists, the reduction of human access to energy and the curtailment of the economic and technological growth fueled by that energy are themselves considered desirable. These environmentalists have promoted the imposition of increasingly harsher restrictions on oil drilling on U.S. land and, subsequently, in waters close to the U.S. coast. In response, many oil companies endeavored to explore and harness oil sources in deep waters far from the shore. Indeed, the Deepwater Horizon rig was the culmination of this response; it produced the deepest oil well in human history―at 10.68 kilometers in depth. Drilling on land and in shallow water has been performed, with relative safety and significant improvements over time, for some 150 years. On the other hand, drilling in deep offshore waters is fraught with hazards that require sophisticated prevention and mitigation technologies. By leaving oil companies no choice but to expand their operations to the deep waters, environmental restrictions on drilling greatly increased the frequency and severity of catastrophic oil spills. Can you imagine an accident at a land-based oil well in Texas or Alaska devastating the economies of areas thousands of kilometers around? Of course not. But this is precisely what can happen when companies drill in deep waters because the federal government severely curtails their ability to drill on land or close to shore. "Perhaps someday we will see a world where the power of a business is limited precisely by what the consumers choose to give it, and the power of government will be used to protect life, liberty, and property―not to dispense special favors or enact draconian restrictions on resource extraction and economic development." Advocates of restrictions on oil drilling would do well to read the work of Ludwig von Mises and Friedrich Hayek, 20th century Austrian economists whose brilliant analyses of unintended consequences of economic restrictions include the insight that many such consequences are undesirable by the criteria of the restrictions’ proponents. Few environmentalists―unless their foremost value is delight in human suffering―rejoice at the consequences of the BP oil spill. Many are genuinely appalled at the massive death of wildlife and pollution of the Gulf of Mexico due to the spill, if nothing else. But some of the laws these same environmentalists staunchly advocated for decades brought about the preconditions necessary for the spill to happen. The BP oil spill is a vast problem, complex in both its causes and its consequences. Much about it is still not known; indeed, even the rate at which the oil is escaping from the well and the amount of subsurface oil resulting from the spill have not been definitively established. New information about the spill will probably continue to emerge for years, if not decades, afterward―as will new analyses and interpretations of the spill’s significance. At the same time, the pressing question remains: what is to be done? Unfortunately, the Obama administration has demonstrated its typical tendency to impose one-size-fits-all restrictions on everybody in response to a problem caused by only a minority of relevant parties. The administration instituted a six-month moratorium on deepwater drilling for all offshore drilling, allegedly in the name of verifying that needed safety measures are in place. But this is a reflection of the strongly collectivistic mentality of the Obama administration. The errors of BP, just one company in the oil business―albeit a gargantuan one―should not be invoked to punish the many other companies who have not had oil spills from their offshore drilling operations. Moreover, they should not result in policies that, by greatly curtailing the supply of oil available for use, will raise fuel prices for all consumers. The oil moratorium adds insult to injury by raising basic living expenses, possibly dramatically, for those individuals who have already suffered adverse effects from the oil spill itself. The moratorium stifles economic progress, which crucially depends on continual access to abundant energy. Worst of all, it violates the essential principle of justice: that only those whose actions cause an ill consequence should be held responsible and penalized as a result. Instead of restricting oil production and further punishing the innocent, the focus of the response to the oil spill should be one of mitigation and reparation. The oil spill must be stopped as soon as possible, with the help of any parties qualified to offer it. I have no fundamental objection to the federal government devoting its personnel and equipment to the effort to stop the spill―provided that taxpayers do not have to pay the bill. If any resources can be readily deployed by the government to minimize any damage, then this is not in itself a problem, as long as the innocent do not have to subsidize the guilty. BP, Transocean, and all other responsible parties should be required to compensate the federal government for all expenses incurred by the government in clean-up and mitigation. At the same time, any third parties willing to offer advice or assistance should be allowed to do so. I am strongly suspicious of the ability of a giant federal bureaucracy and a giant corporate bureaucracy―and especially of the two bureaucracies combined―to develop and deploy the most efficient and competent solutions to this catastrophe. The evidence―the multiple horribly botched attempts to contain the spill―has thus far justified my skepticism. Moreover, these two bureaucracies have strong incentives to attempt to save face rather than to genuinely solve the problem. No viable solution should be ignored, even and especially if it can shed some light on past misconduct by any of the parties involved―as knowledge of such misconduct is essential to achieving justice for the spill’s victims. But the full scope of innovation can only be realized if third parties can participate in the effort directly and of their own initiative, without having to ask BP’s or the government’s permission. Yes, this means that if a team of independent scientists and engineers―however affiliated or motivated―appears at the site of the accident and attempts to contain the spill on its own, it should be allowed to do so, provided that its actions cannot further exacerbate the rate of the spill. As regards compensation for the oil spill’s victims, the ideal situation would be a repeal of all caps on oil companies’ liability due to spills. 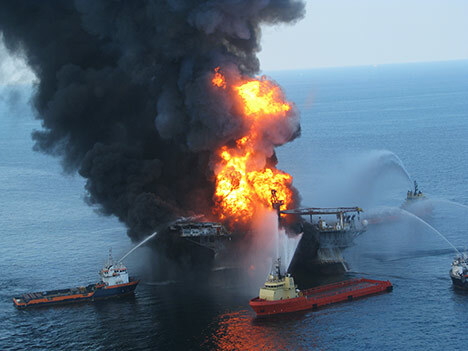 The courts should hold BP and Transocean strictly liable for every penny of loss incurred by individuals and businesses as a result of the oil spill. The nature and extent of the liability of Halliburton―the now notorious company that cemented the Deepwater Horizon rig―should also be explored in the courts. Moreover, large punitive damages should be considered because of the preventable nature of the accident―a properly functioning blowout preventer could have averted it―and the sheer incompetence that BP displayed in attempting to curtail the spill. Even if none of this were the case, I believe that punitive damages would be warranted because of BP’s early attempts to use the power of the U.S. Coast Guard to prohibit photographers from taking images of beaches with accumulations of oil. (See this video, where the Coast Guard threatened a CBS reporter with arrest merely for filming such a beach.) This co-opting of coercive governmental power in order to save face for a private company is corporatism par excellence. The same force of law that BP tried to use to stifle public knowledge of the spill’s extent and effects should be turned onto BP in order to send a strong signal that such abuses of power will not be tolerated. Some of the punitive damages could be used to rehabilitate the wildlife that was devastated by the spill. And if the extent of the damages leads BP into bankruptcy, I say, “Good riddance!” Much better companies will probably emerge to fill the vacuum left by any dissolution of BP or reduction in its power and scope of operations. Perhaps someday we will see a world where the power of a business is limited precisely by what the consumers choose to give it, and the power of government will be used to protect life, liberty, and property―not to dispense special favors or enact draconian restrictions on resource extraction and economic development. Perhaps, in this world, the existence of unintended consequences will be better appreciated, and a much larger allowance will be made for small-scale private solutions to any environmental problems, rather than simplistic one-size-fits-all solutions imposed from the top down by the federal bureaucracy. This could be a world of many competing, efficient, and responsible oil producers that understand their obligation to operate in a safe manner without adverse effects on their neighbors. Alternatively, this might be a world that technologically evolves beyond the need to use oil altogether; we are not there yet, but perhaps someday technically and economically viable alternative sources of energy will be developed and will not pose such catastrophic risks in their extraction. Above all, though, in any world―now or in the future―the basic principles of justice must be held as paramount, with no innocent party being made to suffer for what the guilty have done.